Because it contains fennel fruit, caraway, and English plantain leaf, it supports digestion and digestive system functioning, it boosts appetite, and alleviates flatulence. Because it contains English plantain leaf, it stimulates the gut flora growth, which affects a healthy functioning of the intestines, excretion, and immune defense against microorganisms. A proper immune defense against microorganisms is also stimulated by chamomile flower, fennel fruit, and caraway fruit which the product contains. Fennel and caraway help breastfeeding mothers produce milk. Because it contains chamomile flower, Bobonisan has an anti-inflammatory effect on the gastrointestinal mucosa, which helps the body respond to food allergy. Because it contains chamomile flower and melissa leaf, the product alleviates anxiety and exasperation, and it helps you fall asleep. 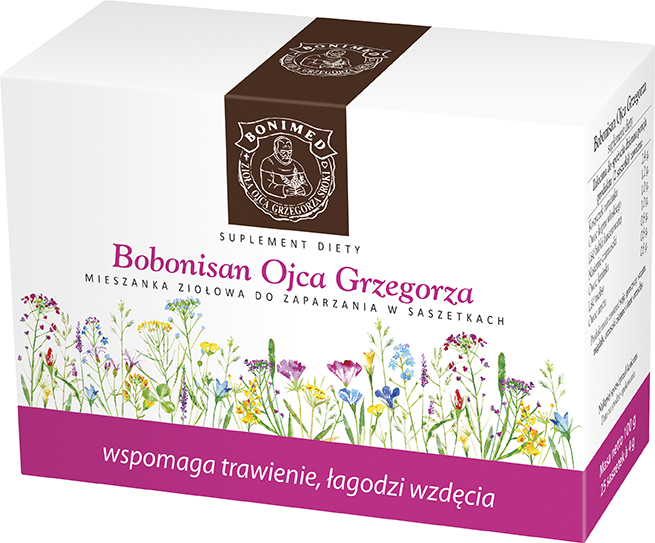 Ingredients: Chamomile flower 30%, fennel fruit 15%, English plantain leaf 12.5%, black cumin seed 12.5%, caraway fruit 10%, melissa leaf 10%, anise fruit 10%. How to use: Take 1 sachet by mouth 2 times per day (make an infusion). Recommended daily intake of the product (2 sachets) contains: Chamomile fruit 2.4 g, fennel fruit 1.2 g, English plantain leaf 1.0 g, black cumin seed 1.0 g, caraway fruit 0.8 g, melissa leaf 0.8 g, anise fruit 0.8g. Caution: Dietary supplements should not be treated as a substitute (replacement) of a varied diet.Do not exceed recommended daily intake during the day. Don’t use it if you are allergic to the product ingredients. If you want to give the product to children and youth, talk to your doctor first.